Rainwater Collection Tanks are also known as rain tanks, rainwater harvesting tanks, and rainwater storage tanks. 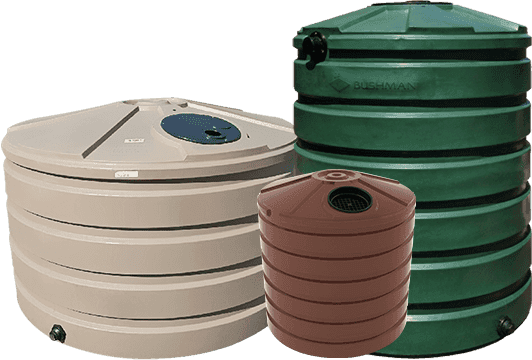 Rainwater tanks are the ideal way to supplement your water supply, especially during times of water use restriction, dry conditions, or contaminated water supplies. Poly-Mart manufactures rain water harvesting tanks by rotationally molding FDA approved high-density virgin polyethylene. The added UV inhibitors protect the tank from sun degradation, so it can be used both indoors and outdoors. These rain tanks have a long lifespan since they are resistant to impact, corrosion, and rust. Rainwater Tank sizes and capacities range from 100 gallons up to 12,500 gallons are available. Every rain tank comes with a lid, an outlet, and a manufacturer’s warranty. Most come with an additional inlet. Additional fittings or outlets may be added upon request.